The (Planet) Jupiter is one of the most difficult objects to observe. lt has most delicate subtle figures on surface atmosphere. Speak frankly my 13″ og showed me nothing but two main belts and 3-4 minor belts since first light the fall 2013 that not ones to surpass 12″, 8″, 6″, or 5″ED or 8″ dob at least in detail performance. Tonight’ early morning It showed me countless wrinkles on the King’s face though just at the 5-6 number of times one time was only shortest moments 2-3 seconds for 10 minutes with rated 9/10 seeing. The other interesting features were as you see , on the nights last autumn just near the first light night, the Europa’s color was turkish blue gray, but on this night it was pale yellow, the surface color of Europa really changed after one year ? 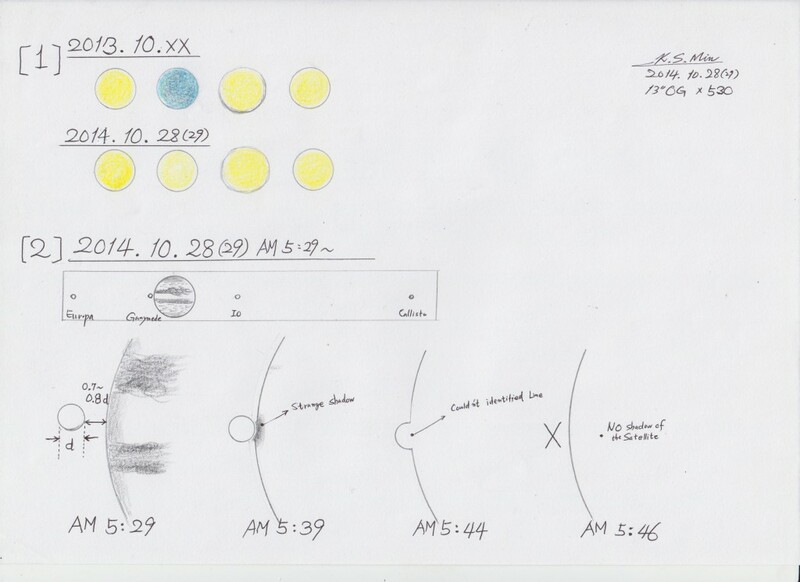 The optical train was(is) same; flat-og-tv bino- tv nagler 7sThe ….. 13″ OG showed Ganymede’s contact moment with Jupiter’s limb, because the 13″ achromat’s chromatic dispersion effect of light produced weak contrast, could not identifyed the exact situation of the contact moment. For 10 minutes Ganymede moved 5280kmx0.7=3696km, the projected velocity of Ganymede is calculated as 3696km/ 600s= 6.16km/every second. # l usually write the observing date till fully to dawn as the same day . Date of observe; Oct. 28( 29). 2014. Pretty fine job, rich in details. By the way, October 28th was my birthday. 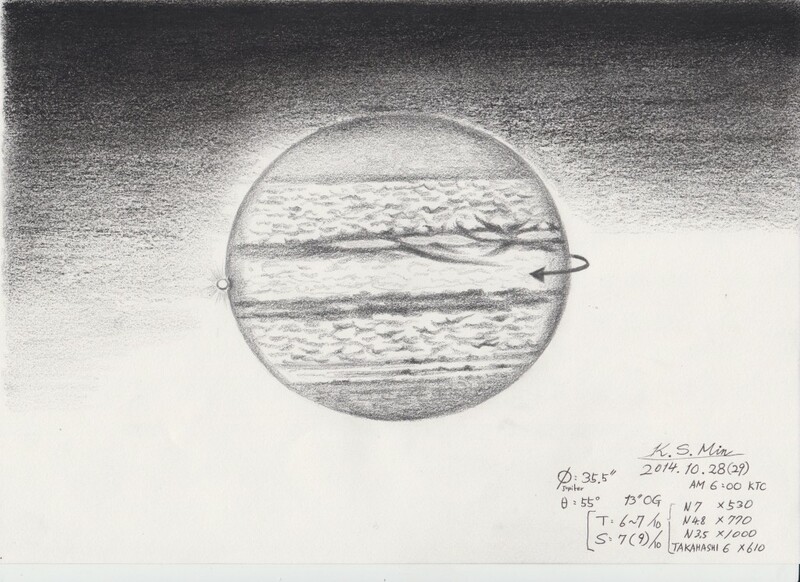 Well done capturing Jupiter and his moons in your large refractor.